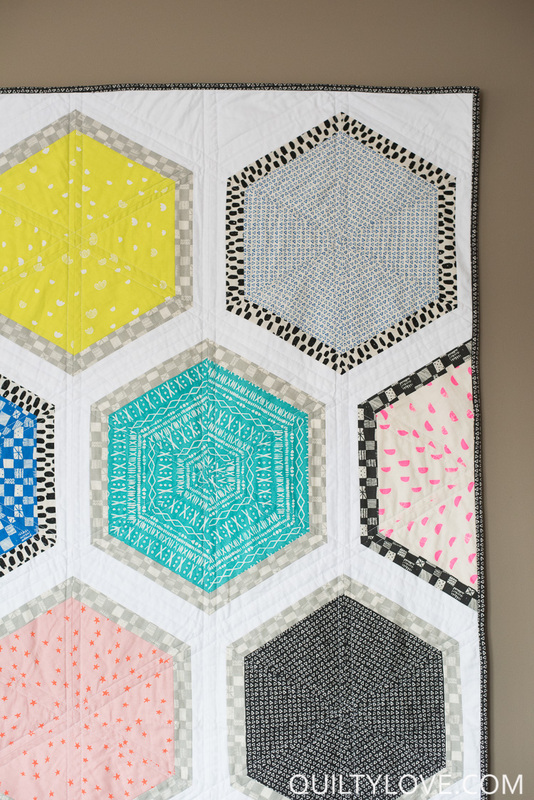 Triangle Hexies is one of my favorite quilts I’ve designed. It’s one of the best sellers too so I’m not the only one who loves it! 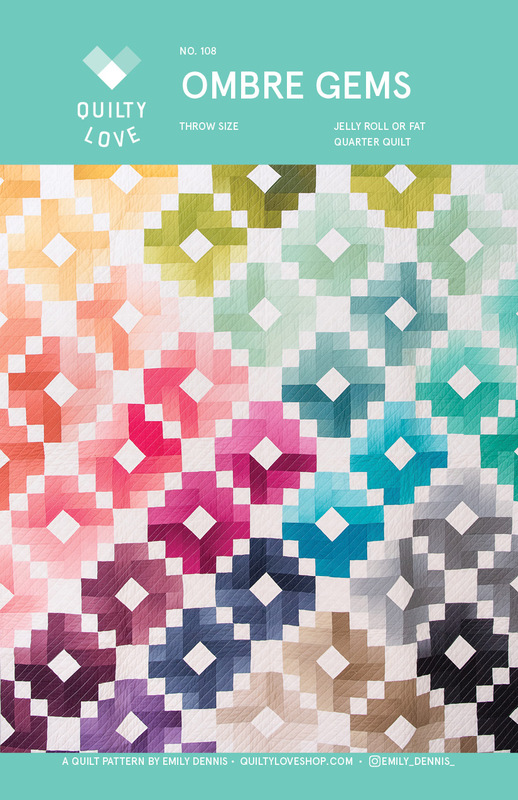 The original pattern has you randomly mixing your triangles. 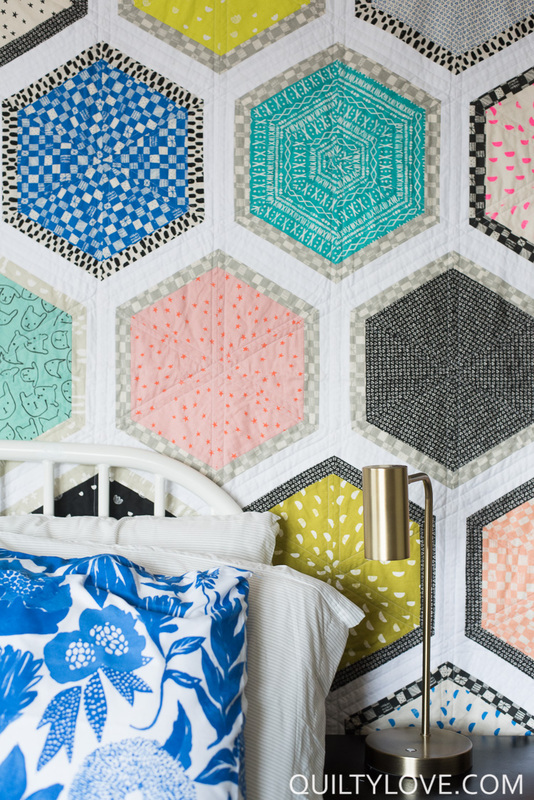 This Cotton and Steel Triangle Hexies quilt is planned out which resulted in one large hexagon of each fabric print! 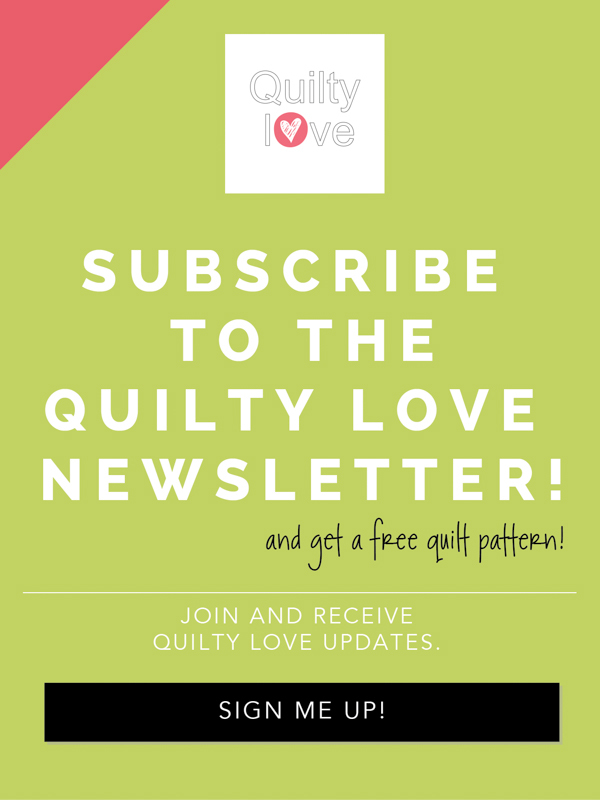 You can still follow the original instructions but will need a few extra fat quarters to have enough fabric to plan it out like this. 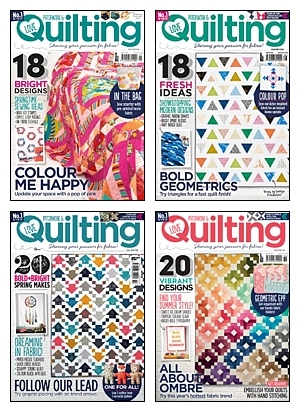 There are 20 blocks so using 20 different fat quarters is the easiest way to plan it like this. 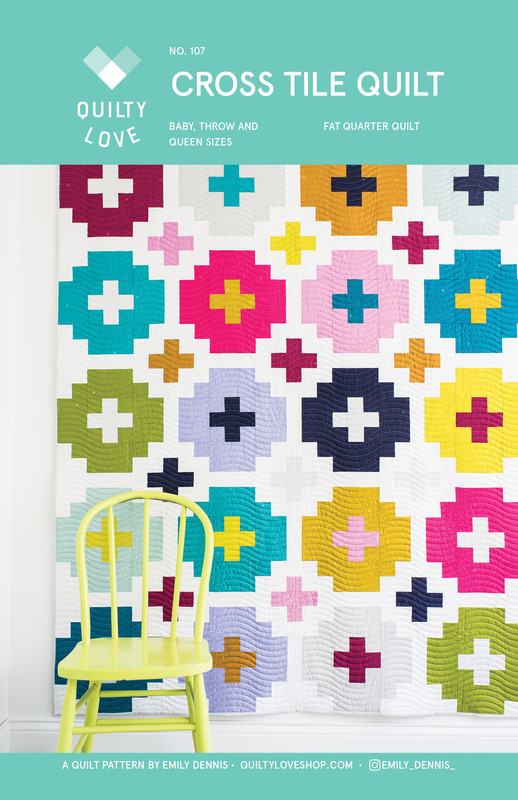 Triangle Hexies is made up of triangles and I recommend this ruler or a similar 8.5in one when you make your own. 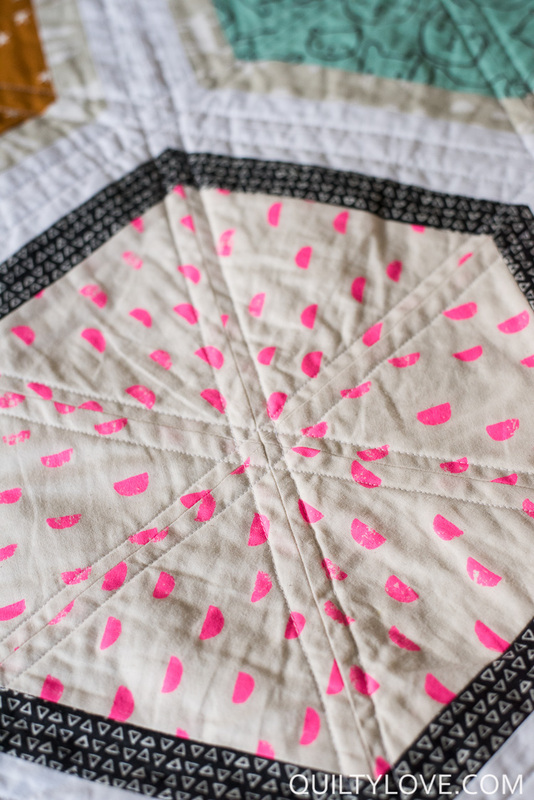 Using a ruler will provide for much more accurate cuts which in turn means accurate piecing. Templates are provided though if you don’t want to add a triangle ruler to your tool line up. 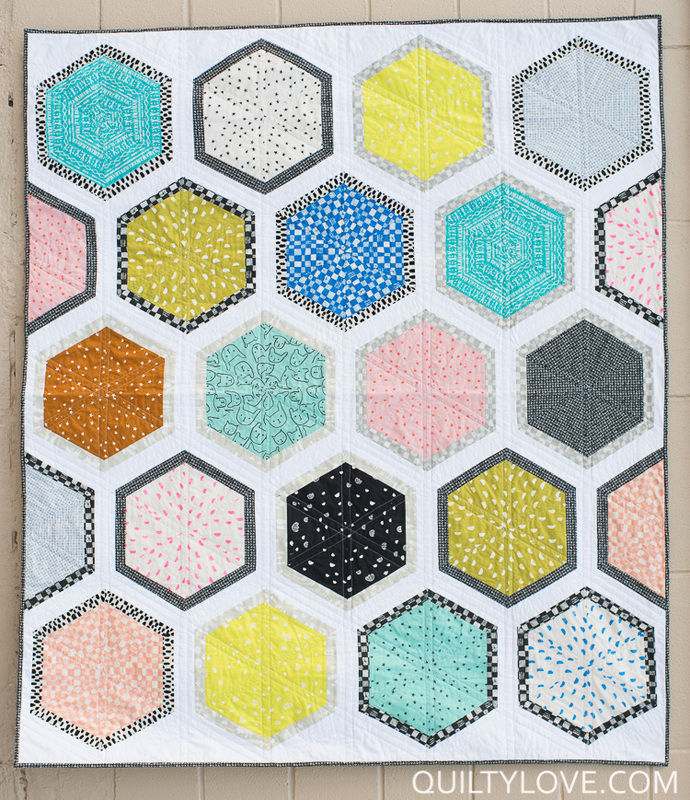 Instead of solid color sashing I used various blacks and greys from this Cotton and Steel line to frame each hexagon. 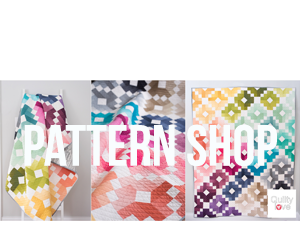 This fabric line is Print Shop for Cotton and Steel by Alexia Abegg. 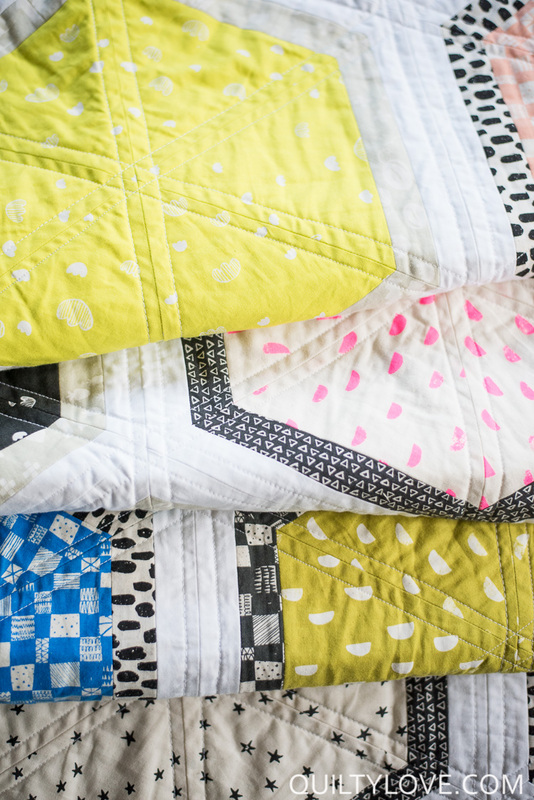 Print Shop one of my favorite fabric lines so I hoarded this fat quarter bundle. 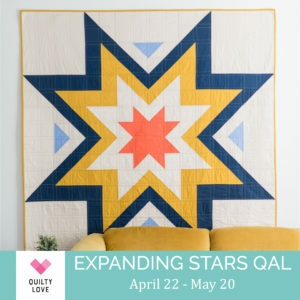 This Expanding Stars Quilt also uses this fabric line. 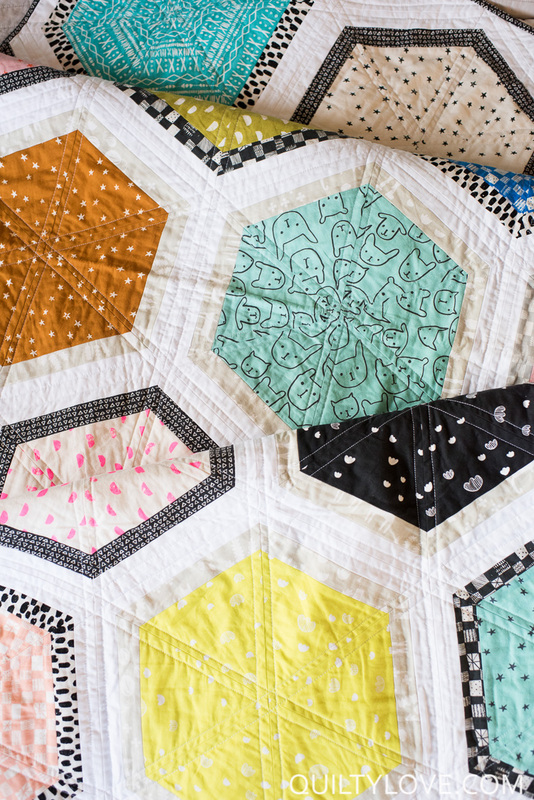 Triangle Hexies goes together fairly quickly and is (ambitious) beginner friendly. 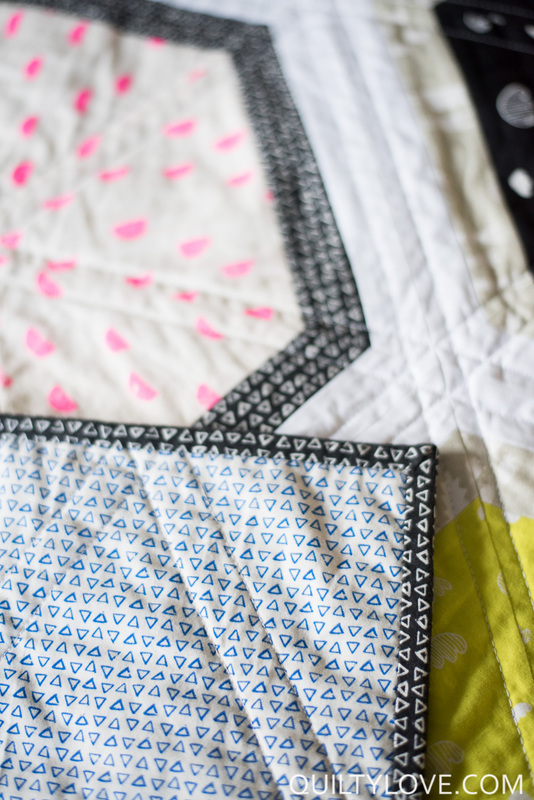 Piecing triangles like this is much easier with a ruler that has the lopped off top. I don’t know the technical terms for it ;) But that straight top makes lining up and piecing much easier. 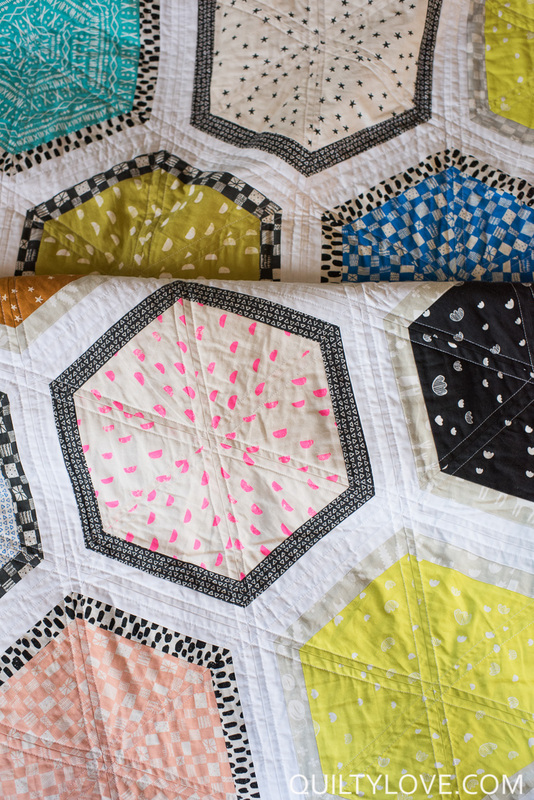 This is the third triangle hexies quilt I’ve made and each time I’m surprised at how quickly it goes together. 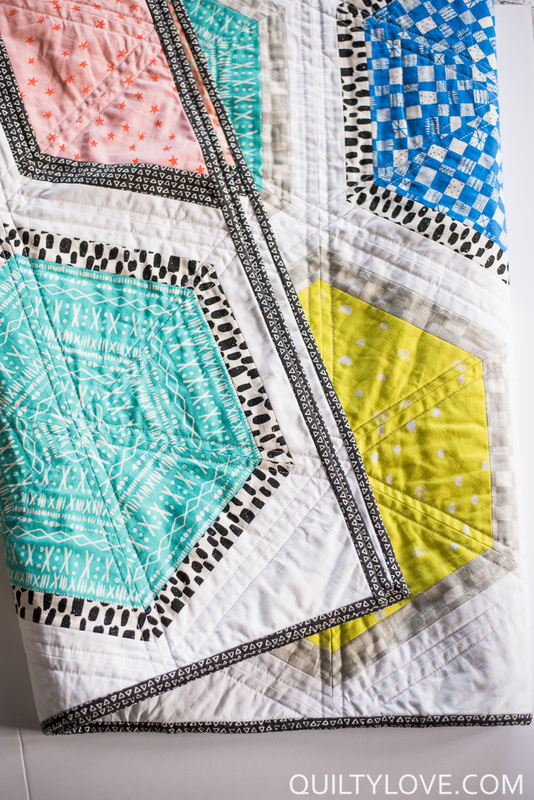 At least the quilt top… binding.. that’s another story ;) All three have been throw sizes. It seems to be the most popular size I make. 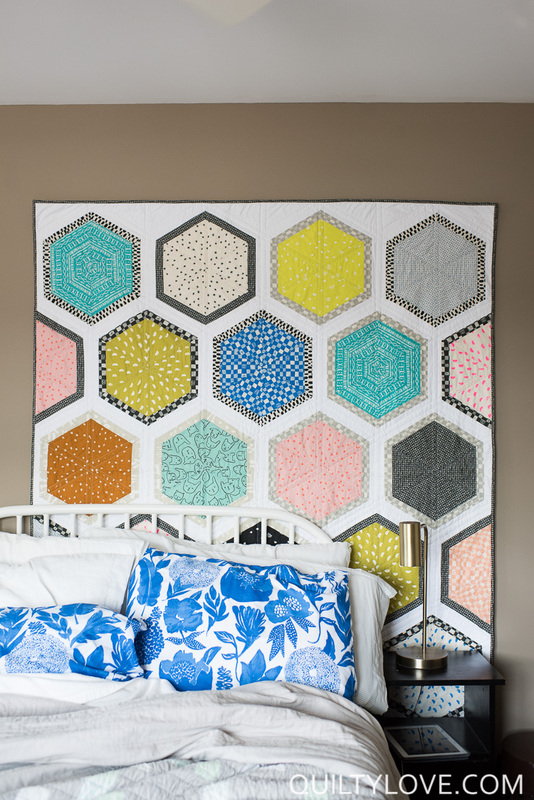 It’s a nice generous size throw quilt at 60in x 70in. When I do straight lines like this with my walking foot I usually up my stitch length to about 3. I like the stitches a little more visible like that. Plus it goes faster ;) See a theme here…?! 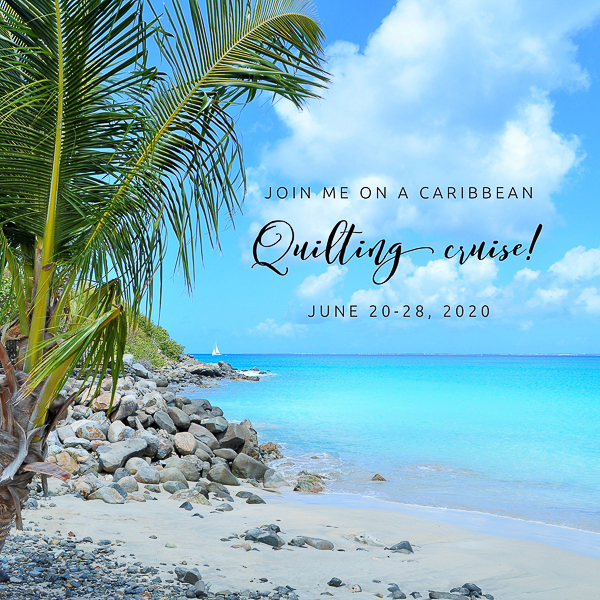 Most of my quilting is done with Connecting threads 50 wt thread. 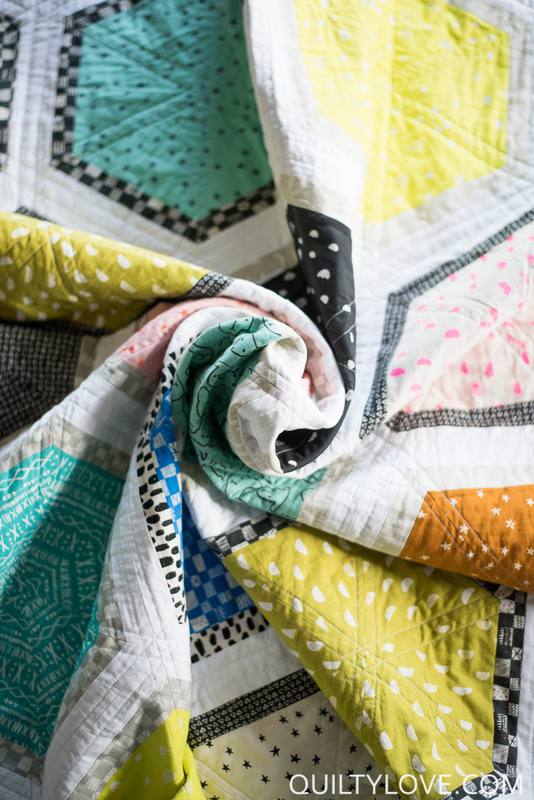 This Cotton and Steel Triangle Hexies quilt is backed in one of my favorite prints from this Print Shop line. Point Blue triangles. 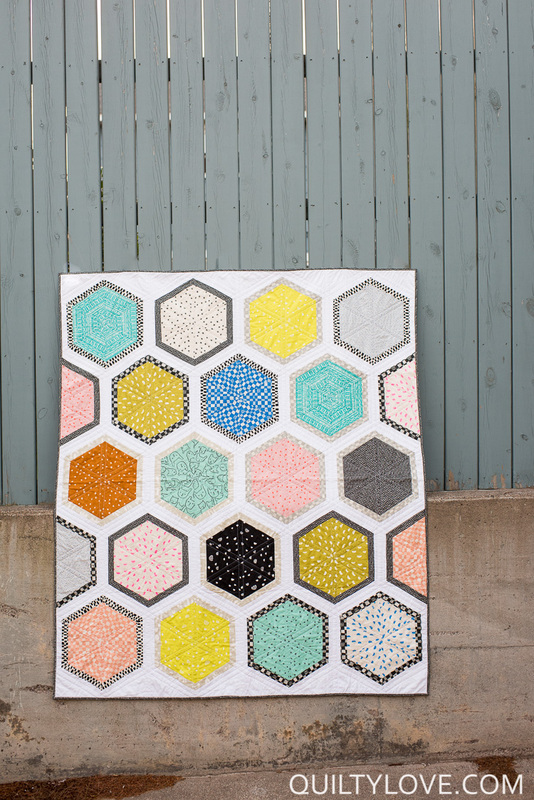 I love a subtle backing fabric like this. The binding is the same fabric in black. I had fun photographing this one! 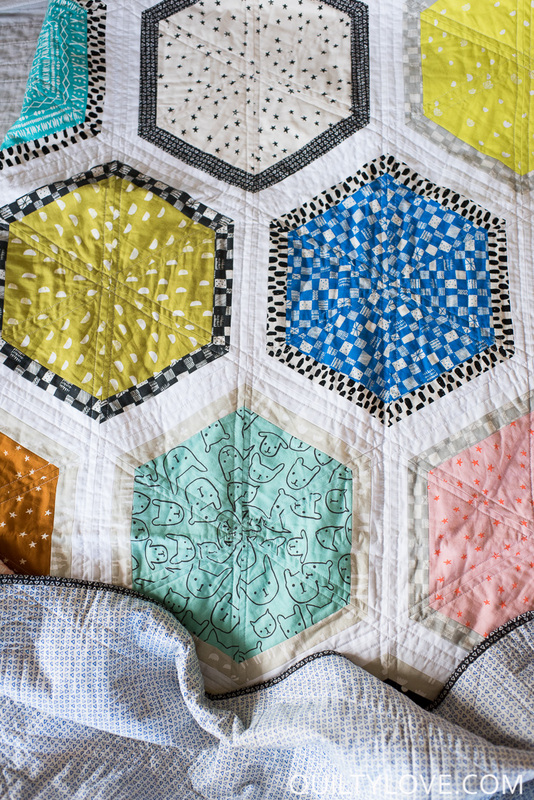 Lately I’ve really enjoyed the process of photographing quilts. Maybe it’s the fact that I’m living in new surroundings so there are new options and new challenges to figure out. Either way it’s been fun. 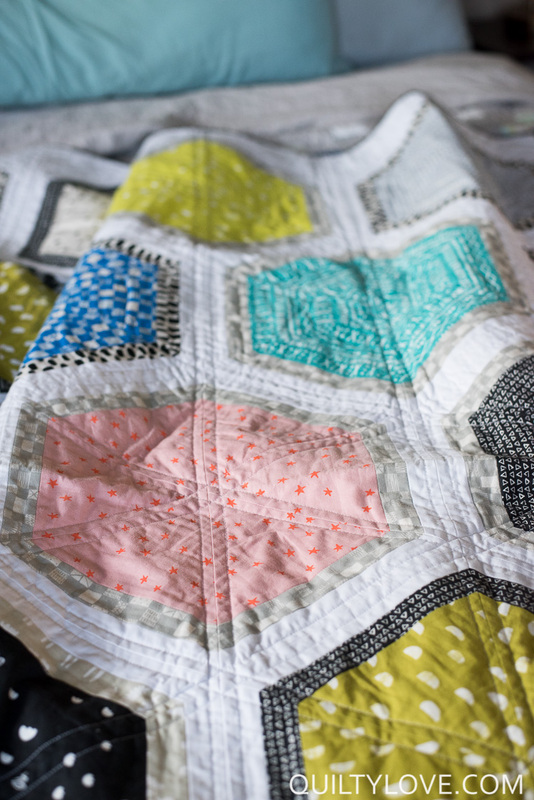 Majority of my quilt photos are taken with a 50mm lens which is a lens I highly recommend for everyone. I use this one for my Nikon DSLR and this is the Canon equilvalent. Not all lenses work with all cameras so make sure it’s the right one for yours. 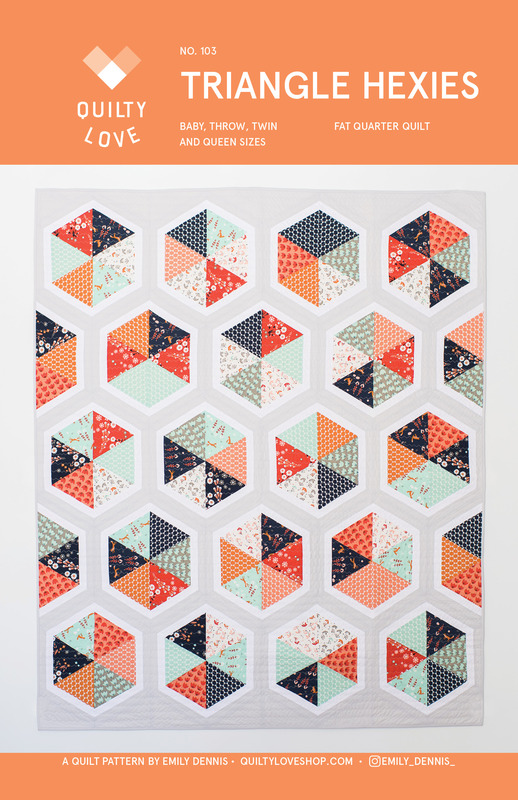 Triangle Hexies is available in my pattern shop!